It is a well-known fact that bathrooms and kitchens are key selling points in any home and are therefore popular renovation projects. The Appraisal Institute of Canada confirms that these renos are the most popular because of their 75 % recovery rate. Renovations are always driven by budget, however, so we have sourced a few clever and inexpensive DIY ideas and trends that will inspire you to get your hands dirty. Bathrooms are often the battlefield of the sexes. By adding a second basin, a mirror, and taps, you create space for two people to get ready at the same time while staying out of each other’s way. Because new plumbing can be added to existing pipes, it is less expensive than you think if you have the space! Remember to keep lighting in mind so that both parties can be seen in the best light in front of the mirror. Open bulbs and cage pendant lights are both very popular, but be sure to purchase a light fitting that is sufficiently insulated for use in a humid environment. 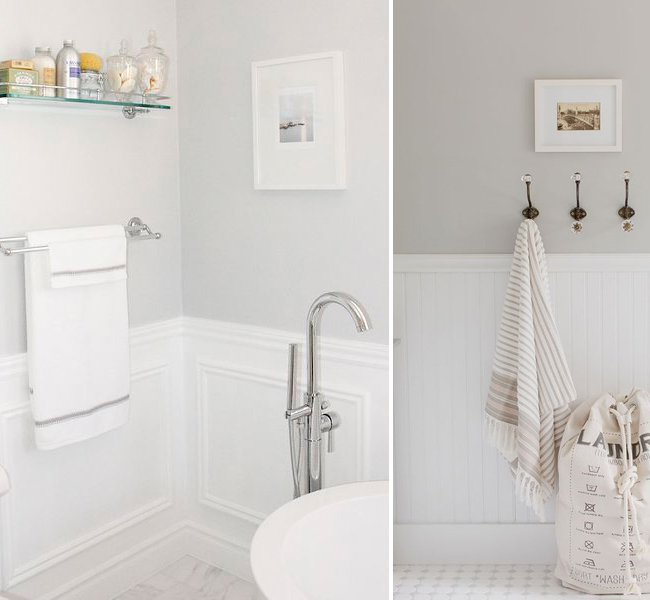 Replacing hardware with updated styles can be a big plus in any bathroom. It changes the look instantly and can add a luxurious facelift. No more leaky taps that waste precious water or fittings that can’t be buffed beyond a dull gray. Matte black faucets are the most surprising trend in bathroom fixtures this year, and they make a very powerful statement. For the best effect, pair them with the right accessories and architectural details like black, metal-framed industrial windows or shower doors. Cabinets can easily be transformed with a little imagination and some elbow grease. Create a Shaker look by adding wooden strips to frame the edges of your current cabinet doors. Give the doors a fresh lick of paint and replace the handles to make them look brand new. You can even add feet to the cabinets to lift them off the floor, creating some extra personality. Choose a style that complements the look and feel you want to create. If you want to add pattern and colour to your bathroom, consider installing a Moroccan pattern tiled floor. It is currently very popular in bathroom designs and makes for a powerful first impression. If you want something a bit more subtle, add only tile edging with a pattern. A lovely budget-friendly way of incorporating this trend is to use one tile mounted on a wooden block as your soap dish. You can also use smaller patterned tiles to create a frame around your bathroom mirror. Visit your local bathroom store to view the large range of impressive shower heads. The options are endless, with everything from heads that recreate waterfalls to pulsation showers that massage. Having his and hers shower heads are a great addition to a bathroom if space allows; this is a small alteration that can make all the difference. Choose the best fittings that you can afford to guarantee maximum added value to your home. If you are renovating on a tight budget but want maximum effect, it is worthwhile considering wainscoting for texture and architectural interest. It’s relatively inexpensive and can be used to finish walls as well as to clad an inexpensive bath to make it look more luxurious. Traditionally associated with cottage-style or traditional houses, wainscoting is seen more regularly now in modern homes wanting to add architectural detail to the bathroom. To finish newly installed paneling, ensure that you use primer and paint that are sufficiently suitable for a bathroom. Natural light is great for applying makeup in a bathroom; it gives you a more accurate result than artificial lighting which can sometimes be misleading and create shadows. A bathroom is a great place to accentuate a big, open window, especially if there’s a gorgeous view on the other side. If, however, your bathroom view is less than desirable, or if you are concerned about privacy, install frosted glass which will let in light without giving the neighbours something to look at. Heated towel rails or under-floor heating are fantastic bonus features in a bathroom. Think spa, but with a bit more personality. There is nothing more luxurious than wrapping yourself up in a heated towel on a cold winter morning. We seem to need an endless number of things in the bathroom, but having them all on display simply creates clutter. Maximize your existing cabinet space by using organizers on the inside of cabinet doors and drawers. You can even add vintage free-standing cabinets or baskets as statement pieces. • Put your most expensive products on display as a collection to create a great impression. • Use mesh baskets to store perfectly-folded, fresh, white hand towels or have your bath towels displayed on a ladder. • Foliage adds a touch of green to an otherwise neutral environment, so simply add a beautiful glass vase with a single stem leaf to freshen things up. If you have green fingers, you can play around with plants to soften the edges. • Always remember that it is very important to keep your bathroom smelling hygienic and fresh. Be careful not to overpower by using cheap air fresheners. Instead, spend a bit more time selecting a scent that works for you, and look for burners or scent diffusers that use aromatic oils. Having a fresh bunch of eucalyptus leaves on display is a lovely way to scent the air naturally while adding style.